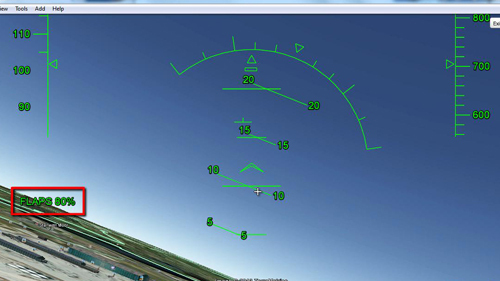 In this tutorial you are going to learn the basics of using Google Earth flight simulator. To play this game you are going to need to have Google Earth installed. Start the program and in the menu at the top click “Tools” then “Enter Flight Simulator”. A window will appear and you will have several flight options, choose an aircraft, a destination to depart from (here we are choosing Heathrow) and then click “Start Flight”. 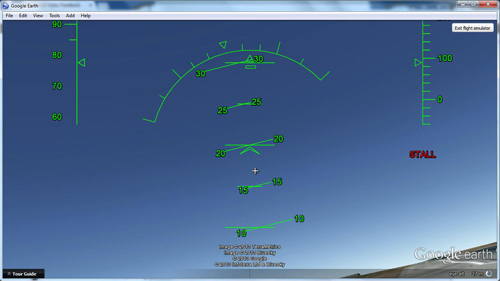 You will be taken to the runway of the location you selected and a green display panel will appear. The controls are fairly easy to use when you have got used to them. First press and hold “Page up” on the keyboard to increase thrust. The aircraft will accelerate and you can see the speed in the top right, when you are ready to lift off, hold down the down arrow and wait for the aircraft to take off. Once in the air you can use the arrow keys to control the aircraft – the mouse also works as a control but it is more difficult to use. To increase airspeed use “page up” and to decrease use “page down”. Now that we are in the air you can use the “G” key on the keyboard to toggle the landing gear. The square bracket keys can be used to increase or decrease the flaps (higher percentage will decrease airspeed). 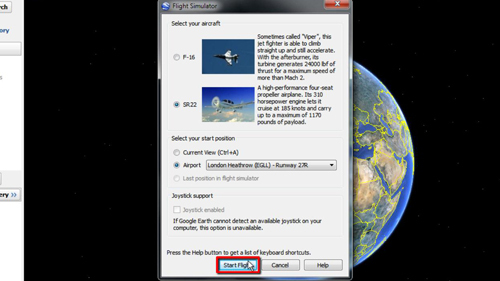 Those are the basic steps to using Google Earth flight simulator.